Last weekend, we went to my sister's house for a family get-together as my brother and his partner were visiting from Colorado. We had not seen him since my sister's wedding nearly 4 years ago. I was given a fabulous new cook book, New West Cuisine, thanks A and S! One of the dishes I took along was a Mexican layered dip. It's easy to put together and travels well. You can cut the calories by using low fat cream cheese, mayonnaise and cheddar. Serve with lime tortilla chips, or plain ones. 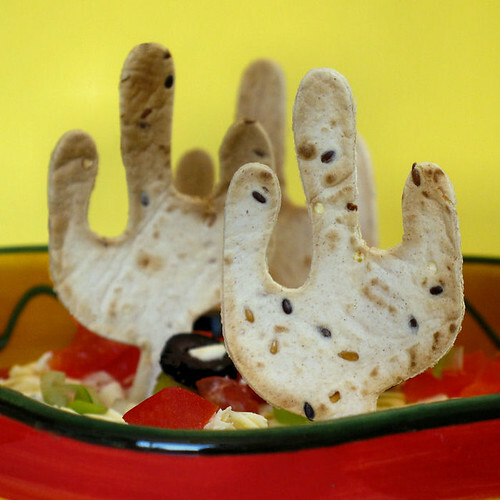 The saguaro chips are made from multi-seed tortillas, using a shaped cookie cutter, they are then baked in the oven. Use low fat cream cheese, mayo and cheddar for a healthier option. Spread the refried beans in a serving dish that is about 200mm/8" square. Mix the cream cheese with the mayonnaise and spread this over the top of the refried beans. Sprinkle the grated cheese on the top of the cream cheese mixture, followed by the chopped tomatoes, sliced olives, spring onions, red peppers and finally the sliced chillies. This Mexican layered dip is being served up at the second Tried, Tested, and True event, hosted by Equal Opportunity Kitchen. The emphasis is on healthy lower fat dishes, that are family favourites. 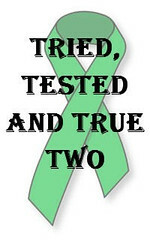 This event also aims to raise awareness of the importance of organ donation. This dip looks amazing and the cactus is genius! I'm always so impressed with your photos. You're talented! Your Saguaro Chips are too cute and your fabulous photos are so festive! Great post! Great pictures as usual Nic, I have never had that dip before but it looks really tasty. Wow - I love those saguaro chips! Nic I could eat that right now and it's only 7am! Your photos are fantastic - as always. Those cactus tortilla chips are too cool! Dragon - aww, thanks so much! Raquel - you could just make a little one, the amount of beans in this one make quite a large one. Angela - hi there, thanks for visiting and I hope you give it a go! Jan - you'd better be cracking open the museli at this time of the morning, stop looking at food blogs! Grace - you can get so much more on a spoon! Peabody - thanks, they make a lovely presentation. Actually, I took the photos with the cactus chips before I went to my sister's and I forgot to put them on when I got there!! I love the cactus chips! I must say, those cacti look so cute in that colourful dip. You are so clever to cut out your own styled chips. Never thought of that one. My kids would love that! Thanks. I really like Mexican layered dips, every bite tastes different! YUM Nic...far out! This is very tried, true & tested...love it. Precious Saguaro chips too; very innovative. Great post for a great event! so lovely.. amazing dip! great pics! What a beautiful presentation! The chips, bowl, and colorful dip sure looks inviting. Yum! Cute chips! The dip looks so fresh and colourful. Love the cactus chips - Love mexican - i will be making this soon!! I love those saguaro chips! I bet your dip was a hit with your family. My mom's always is at our house. Wow! I love those chips so much. I bet they were quite the hit. They make the dip all that much more festive. One of my favorite dips is quite similar to this. This combination of ingredients is just unbeatable. It's such a crowd pleaser--I've met few people who really don't like a dip containing these ingredients. I bet my DH would adore this dip as he loves Mexican food. Great pics as always Nic. You are one talented lady! 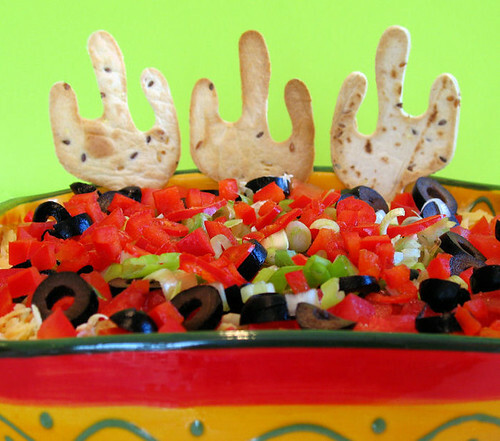 What a fantastic looking mexican dip! Love the vibrant colours. Those cactus shaped chips are just too cute! i love layered dip and you are making me crave it now with those photos! The dip sounds great, and the cactus tortilla chips are really cute :) Great presentation! This is a beautiful dish and a great entry for TT2. Look at those beautiful colors! Thank you all for your awesome comments! This is a great blog-- thanks for writing it. I'm obsessed with food and I've been trying to write more about London restaurants on my own blog http://backwardscity.blogspot.com/ Let me know what you think. Love the cactus chips. I've never seen a cactus shaped cutter before. That dip looks amazing! Nice cactus chips. Oh YUM! That looks fantastic and the flavours seem so fresh. But what I most like is those cactus crackers :) Love the pics too. This dip is such a hit!!! Did you cut out the cacti yourself? Gorgeous, just gorgeous. Christian - thanks and I'll take a look! Y - thank you, the cutters are popular in Tucson! Parker - aren't they cute? 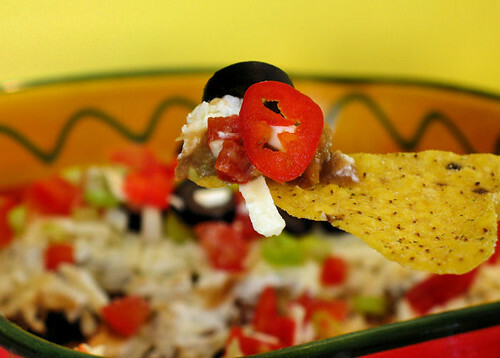 Make some for your next dip/party! Jeanne - thanks so much! Giz - thank you! I used a cookie cutter to cut them out! Beautiful photos.the colors are just so amazing and I can just imagine the crunch!!!!! Such a colourful posting and wonderful photo's. 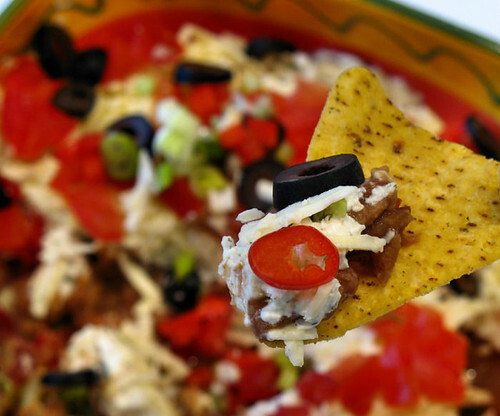 ahhhh, the crowd-pleasing 7 layer dip as we call it in my family! you've taken a very common (and sometimes made w/o care) dish and pumped it up to look extremely creatively made and lovely! it is delicious. Cynthia - ha, ha! Thanks! Kristen - thank you so much and welcome to my blog! Nina - thanks, and yes, it's got a bit of a crunch! We Are Never Full - thank you so much for your comments! Nice to see you here. Manju - thank you! When you live in Tucson you acquire a bunch of desert style cutters etc! I have some beautiful bowls and pictures with cactuses on them - I love them!!! Are those the freakin' cutest chips ever? Look AT these, all southwest and everything! Love 'em, Nic! How perfect would these be for here in AZ? Too adorable. I just found your blog! I love those chips!!! They are so fun! The dip sounds/looks delicious, too! Beat the heat with a Greek salad!